We live on an island where the only access is by private boat or water taxi. I keep my boat "Coquette" on a mooring buoy in front of our home. I have recently put in a new buoy and have made this harness for the critical connection between the buoy and the boat. I used 1/2 inch nylon mooring lines and spliced 1/2 inch ss thimbles using 1/2 inch ss bow shackles to attach the 1/2 inch ss swivel. 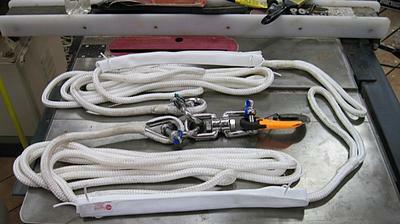 The attaching clip is a high strength mooring clip which can be attached or released with one hand. The adjustable chafe guards will protect the line through the bow chocks. Any helpful thoughts for improvement would be appreciated. Any other ideas? What have you done?